Many Korean dishes contain jeotgal whether we realize it or not. Jeotgal refers to a category of seafood pickled with salt. When naming a specific type of jeotgal, the word “jeot” is used as a suffix. A wide variety of seafood can be used as a jeotgal ingredient, including oysters, clams, fish, roe and tiny shrimps, as well as fish gills and intestines. Depending on the ingredient, fermentation period may differ, from a few days to three months. But most Koreans these days purchase jeotgal at local supermarkets. Jeotgal has a long history, as pickling was one of the few techniques to preserve food when refrigeration was not available. The fermentation process creates bacteria, beneficial for health. But as jeotgal dishes are high in sodium content, they should be served in an appropriate amount. Cheongeoaljeot, salted herring roe, is a dish that originates from Gangwon Province. Due to fermentation, the tiny little eggs don’t have much taste, except for the granular texture. It’s the sauce that defines the dish. The salted roe can be enjoyed with tofu, as tofu mutes the saltiness of pickled roe somewhat. 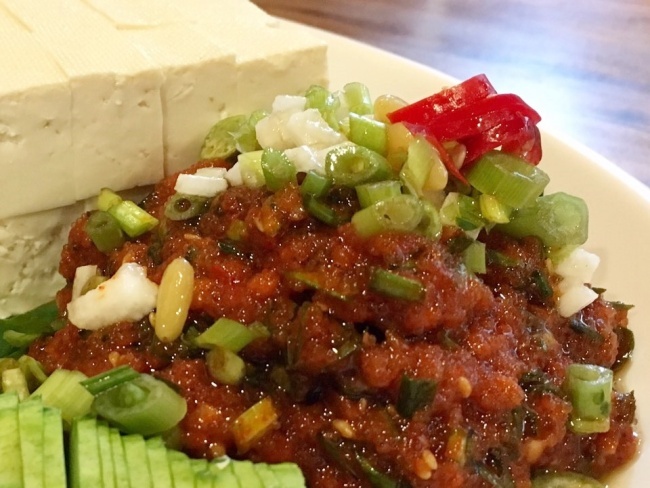 A slice of tofu topped with a pinch of cheongeoaljeot visually resembles a canape. One of the most common jeotgal is ojingeojeot, squid pickled in salt. 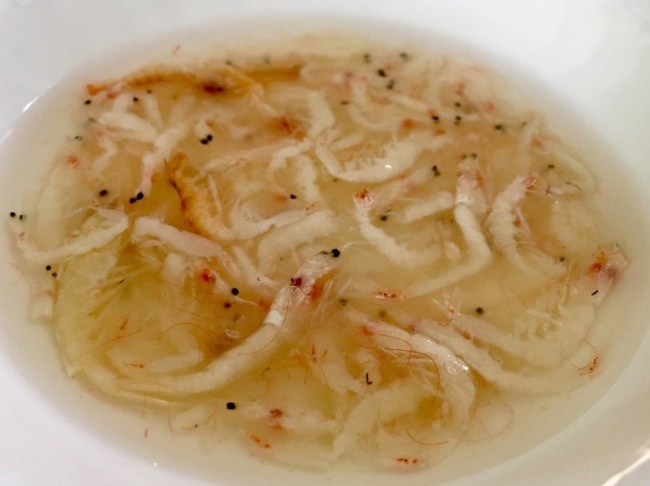 Though it may look unpleasant at first sight, as slimy shreds of squid are tangled up, it has a sweet and spicy taste, making it best enjoyed as an everyday banchan (side dish), served with a bowl of rice. Though jeotgal is often enjoyed as banchan, it is also used as a condiment. When eating pork dishes, saeujeot, pickled shrimp, is always served as a dipping sauce. Saeujeot, which comes in a very salty broth-like liquid, is essential to making kimchi. Other types of jeotgal are used for kimchi too, depending on the regions, and Koreans often say jeotgal has to be good in order for kimchi to taste good.